Bayern brought their starting 11, who have been in training longer and played more friendlies so far this summer. So they came out of the gate at a frantic pace and looked threatening right away. But Milan remained calm, albeit disorganized, and it was Ibrahimovic who struck first, to silence those who don’t like his new hairstyle. Milan still lacked in possession, but the goal calmed them even further. Well except Nesta, he tried to pull Gomez' shorts off. Van Bommel had been recognized at the beginning of the match for his contributions to Bayern in front of a crowd of 70,000, which seemed to go to his head, as he argued with the referee over a foul just like when he was Bayern captain. Luckily for him, the ensuing free kick was sent wide. Taiwo showed pace and stamina, but also that he was not quite ready to defend, at least not the wily Arjen Robben. But he seemed to be on a quick learning curve, and even managed to injure Robben before the end of the night. Taiwo did have a couple of key clearances, though, and I hope to see plenty more where that came from. On the other side, Abate took a knock around the 30th, and was then subbed off in the 61st minute, so let’s hope that was just precautionary. He came out his usual beastly self, and while he was light on offense, he was key on defense, coming over to help Nesta a couple of times, who was paired with Bonera. Yes, you read that right, we played with Bonera at CB. And while you are recovering from that shock, here’s another: It was Bonera’s long ball forward to Ibra that saw the goal. (Re-read that as many times as necessary, it is not a typo.) However that was definitely his only contribution to the game. At the half, Allegri swapped Nesta for Silva, meaning that at any given time, we had one CB in defense, and for the first 60 minutes, Abate. Other than that, it was the Abbiati show. 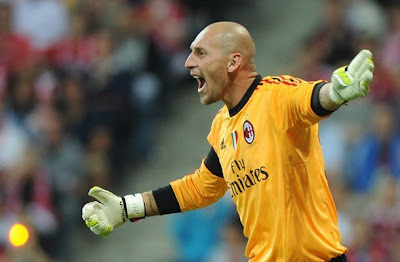 Other than giving up a goal from Kroos that went through Gattuso and Nesta first, Abbiati was his own phenomenal self. Save after save after incredible save, he has to be my Man of the Match. If you looked at the scoreboard, 1-1 in the 34th, you might not know it, but I bet Abbiati is still a little shell-shocked from making so many saves. We got to see Paloschi and Valoti, and Emanuelson played nearly the whole match, too, running around nonstop. But in the end, after fighting off wave after wave of attacks from Gomez, Schweinsteiger, Kroos, and company, it went down to a penalty shootout. Bayern went 5 for 5, while Milan, starting with 3 for 3, sent the young Paloschi up to kick fourth, which sent Milan to the 3rd place game instead of the final. Bayern 5-3 on penalties. This game, AC Milan came out stronger, with a stronger lineup. Okay, we still had Antonini at LB, but Zambrotta was a sight for sore eyes after yesterday’s Oddo-Bonera-Antonini defensive three stooges nightmare. Our strength showed in the third minute as Seedorf slipped a ball to Robinho who slipped it to Ibrahimovic, who of course scored. Gattuso came out stronger, too, and was rewarded with a yellow card for it in the 19th minute. But despite having Silva and Yepes paired together, we gave up a Damiao goal from an assist by Gilberto in the 23rd. Don’t worry, though, Gilberto was subbed out with an injury just 4 minutes later. That will teach him to help score against Milan. Tied at 1. Milan played relatively attacking football for a while, but in the end, a D’Alessandro equalizer on one of Yepes’ random errors in the 80th would send this match to penalties as well. We got to see young Di Sciglio, and more of Valoti. Let’s hope that this is not the last we see of them, they look promising. Also of note, Boateng was whistled and jeered each time he touched the ball. It seems these German fans haven’t forgotten his brutal tackle on Michael Ballack last year that kept him out of the World Cup. But if he noticed, he didn't let on. But I digress… penalty shootout, oh how proud can we be? On paper, it looks as though we really bombed, having missed 4 out of 4. But in reality, Renan, the Internacional keeper, saved 3 of the 4. He was brilliant. I guess after losing to Barca on PK’s yesterday, he really wanted to prove himself. It was the king of penalties, Massimo Oddo, who actually missed. Oh well, 4 misses for 4th place. It was destiny. Or lack or preparation. Or lack of match fitness. Whatever, at least we are consistent. I do have to say that my TV feed was less interested in this game than me. Just after halftime, they kept putting up a picture-in-picture of Barcelona preparing and arriving for the REAL match, the one all of the fans came to see. So maybe no one will notice we came in fourth. And Barca won, of course, with a trophy celebration that rivaled naptime at the retirement home. The confetti was the most excited thing there, and even it was kind of lame. Oh, Audi Cup, how I will miss you for 2 years. Serie A Schedule 2011-2012 released!!! This post was compiled during/inspired by the shocking defeat of Bayern Munich by the most predictable club in the world in a preseason tournament that no one cares about.